Doctors use Advanced Surgical Institute to perform minimally invasive Laminectomies. A Laminectomy is a spine surgery to remove the thin plate of bone, or lamina, that covers the spinal cord in each of your vertebra. A Laminectomy spine surgery enlarges the spinal canal to relieve the pressure on the nerves and spinal cord, easing your pain. Your doctor removes lamina bone and bone spurs to relieve pressure on the affected nerve(s). 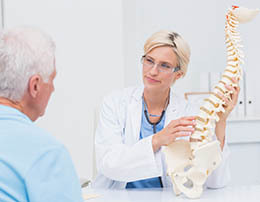 If a herniated disk is present, your doctor may remove it. Laminectomy patients are usually able to walk immediately after spine surgery. You will be able to recover in the comfort of your own home.